Sparkly Runner: Introducing... Gouty Foot?! Well folks, it seems like my right foot, my "cranky" foot, was lonely and needed a partner in crime. Allow me to introduce to you.... "Gouty Foot!" Yup, that's about right. Source. A year and a half ago, I visited a podiatrist because I had some pain in my left arch and my left big toe- I assumed it was from wearing heels. The podiatrist diagnosed me with Plantar Fasciitis and said that I had a slight alignment issue with my big toe joint. He gave me custom orthodic inserts and said that it should clear up both problems. I went on about my life with some lingering pain in my big toe- not when I ran, just a little soreness and a little achy after long runs. I noticed that I had some limited range of motion- my left big toe won't bend back as far as my right- but it's never been anything I really thought too much about. I trusted that the podiatrist was right and that as long as I wore the inserts I would be ok.
Fast forward to Sunday night. 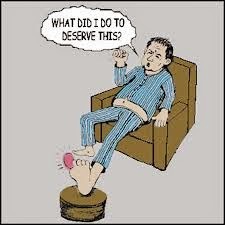 As I'm getting ready for bed, I get a sharp and severe pain in my left big toe. This wasn't all together new- over the past few weeks, I've been having 10 minute bouts of shooting pain in this toe, along with the inability to move it. It comes on suddenly, always at night. It only lasts for a few minutes and then it's gone and my toe feels fine. Well on Sunday, it didn't stop. I woke up Monday and could barely walk. I couldn't get a shoe on my foot without excruciating pain. I decided to go to an urgent care facility that opened at nine. As I waited, I made breakfast and had a cup of coffee. About 45 minutes after I woke up, the pain was gone, just like that. I still went to the urgent care where the doctor took some xrays and gave me a diagnosis of pseudo gout. Yup, fake gout. Did you even know that is a thing?! Basically, it is a build up of crystals in your joints that mimic the symptoms of gout. The doctor also said that he could see the beginning of a bone spur on the top of my first metatarsal and some bone degeneration- but he didn't think that was what was causing the pain. What the heck?! I'm only 30! My bones are degrading?!?! Yeah, I might have freaked out a little. But, I'm not going to full-on freak out just yet. I've got an appointment with my regular doctor tomorrow to run some tests to figure out if I really have pseudo gout or gout. I've also got an appointment with my orthopedic doctor to determine what the course of action is with a bone spur and bone degradation (also known as Hallux Rigidus or Hallux Limitus). There is a course of action that involves foot surgery to remove the spur and help create more space for the joint to move. There is also a last-ditch measure that involves fusing the joint forever- which sounds very scary to me. Regardless of what the eventual diagnosis is, there is something going on with this toe. Hopefully, the solution is something that will allow me to keep being as active as I have been and stop the damage being done to my bones. And, fingers crossed, I can keep running. Zapping you with telepathy from afar with some of my homemade holistic Positive Karmic Juju. I hope you feel better, and good luck with everything. Stay positive! Pseudo Gout? Yikes, I had no idea that was a thing either! I was diagnosed with a bone spur in my right big toe about 10 years ago when I was 18. There was a lot of hobbling around campus my freshman year. My podiatrist seemed to think my pain was caused by tendinitis though, which of course, she attributed to the bone spur... I didn't need to have surgery (the thought of bones being scraped really makes me cringe), but I do wear shoe inserts all the time! I was so worried about picking up running about two years ago, but oddly enough, my foot feels so much better on days that I DO run vs days that I don't. Hopefully you won't need surgery either!